Keynote speaker Linda Larsen’s passion and spontaneous humor stem from over 20 years as a professional actress in film, television and on the legitimate stage. Linda brings all the elements that you look for in a funny motivational speaker: high energy, laughter, interaction, customization, surprises at every turn and content you can use to transform your business and your life. Our speaker Linda Larsen always delivers her talks in a entertaining and fun way that will exceed your expectations. 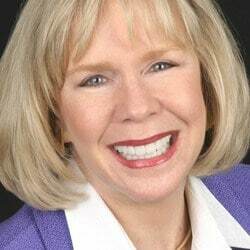 Keynote speaker Linda Larsen has been helping people worldwide to upgrade their thinking, improve their communication and, simply stated, get much better quality results in life, both personally and professionally. And she does this in such extraordinarily fun, fast-paced and memorable ways which boost her reputation around the globe. Planners looking to blow people’s socks off at their annual conferences seek Linda’s services regularly. From her largest audience of 17,000 for the Future Farmers of America to her smallest group of 100 for Meals on Wheels, Linda’s goal is to make her meeting planner look like a rock star, give her audiences a phenomenal experience and be the easiest, most well-prepared speaker her clients ever work with. Her experience and training (she holds a Bachelor of Social Work from the University of South Florida and a Master of Fine Arts from Florida State University) give her the unique ability to combine the entertaining, dynamic aspects of live theater with practical, high-value content to produce lasting, positive changes. What makes the sought-after speaker Linda Larsen so beloved is her “Funny Factor”. Maybe it comes from performing in comedies alongside Sid Caesar, Beau Bridges or Ed Harris (OK, maybe he’s not so funny….) Maybe it comes from just having a bit of a whimsical, skewed look at the world, but Linda can find humor, comedy and hilarity in almost any situation and is more than happy to share that perspective with her audiences. Her critically acclaimed book, True Power, is the riveting and true story of how she was kidnapped and held at gunpoint by an escaped convict for over 5 hours. Her escape, and the positive, practical strategies she used to rise above one of life’s most potent challenges led Investor’s Business Daily to feature her in its Leaders & Success column. And yes, keynote speaker Linda Larsen can even tell this story with moments of strategically placed humor. The highly-acclaimed speaker Linda Larsen is a member of the National Speakers Association and is a Certified Speaking Professional, an earned designation awarded by the National Speakers Association and the International Federation for Professional Speakers to recognize demonstrated commitment to the speaking profession through proven speaking experience. Less than 300 women worldwide hold this designation.